Green Home Builder: How do you think passive building concepts have changed the housing industry? Andrew Michler: Before the advent of central heating and cooling, most buildings, especially housing, were climate adapted using primarily passive measures. This list of measures is long, including tall ceilings and double hung windows to improve air movement; orientation away from the winds and towards the sun; and thermal mass and small windows to control heat gains. Most of our buildings up to the middle of the last century had significant passive measures. Passive House was developed and inspired using the history of vernacular building sciences. The core issues of building heat gains and losses are focused on the envelope being airtight and well insulated on all six sides as the foundation of modern high performance building. It’s a reflection of the past’s reliance in low-tech solutions for comfort, but applies an enormous level of physics to resolve the issues of how to build in varied environments. It turns out this works for just about any type of building in any type of climate. The housing industry has taken to heart that air tightness and high insulation values are a very low cost relative to the energy savings and occupant comfort. But a lot is still left on the table when it comes to solar exposure and protection, thermal bridging, form factor, and indoor air quality. Code takes a long time to catch up with best practices, so new approaches that are more performance than prescriptive will drive the next generation of buildings. A good example is the Energy Step Code in British Columbia. GHB: What inspired you to build the Colorado Passive House? 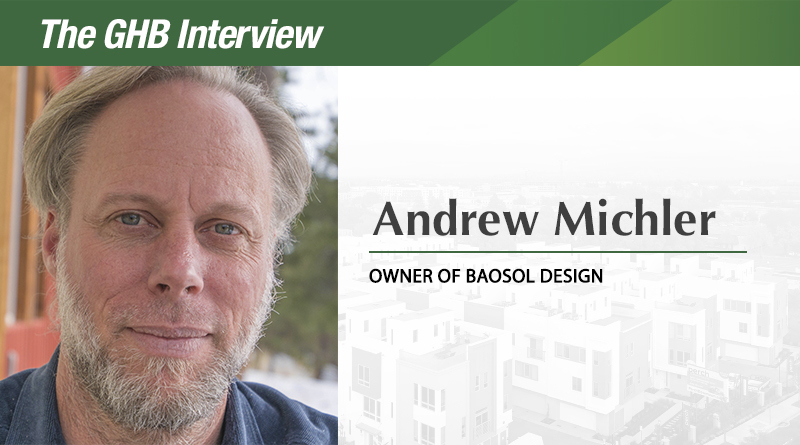 AM: I had lived off the grid for more than 15 years at that point and was looking for a state-of-the-art design process that was holistic and not dependent on a lot of technology to work. Most systems were either too vague or too specific to place. Passive House, at the time, also seemed just daunting and exotic enough that it was worth a try. I was also tired of cutting firewood and living in a house that was either too hot or too cold. It made sense to do most of the investment on the front end and let the house mostly take care of itself when it came to heating and cooling. The idea of building and running a very low carbon intensive home was very intriguing. Along with Passive House, I was very inspired by the cradle-to-cradle approach to materiality and exploring a contemporary architecture for Colorado. After a couple of years using the house, I am still surprised by how tiny the amount of energy is that it uses. GHB: As you demonstrate in your book, sustainable housing is becoming a major influence worldwide. Is there a particular project you were impressed most by when researching? AM: I love small Japanese home design, so when I visited Tokyo to learn more about them for “Hyperlocalization of Architecture,” I realized that the home is really a psychological space. The experimentation of interior volumes, light, and materiality really make these contemporary spaces feel fresh and inviting even if they are perhaps only 600 or 800 square feet. I also learned that the neighborhood is as important as the house. Having a nearby place to eat and visit with friends, a small park, and access to multiple forms of transportation extends the livability well beyond the walls of a house. GHB: What kind of work do you do as a board member of the North American Passive House Network? AM: NAPHN is a grassroots collective of regional Passive House groups which support the standard administered by the Passive House Institute in Germany, of which I head the Rocky Mountains chapter. Nationally we provide the core certified Passive House designers training and an annual conference, which will be in Pittsburgh this year in October. I tend to have a finger in projects like policy, outreach, and advocacy. Being such a young organization, we are in the middle of creating a stronger outreach, and regional platforms such as the Ice Box Challenge help build awareness and capacity in such varied climates. Passive House has done well when a strong group of local practitioners organized and built great buildings, but also developed a strong culture of sharing resources. GHB: What do you think is next for passive building? AM: Passive House is a very specific and aggressive performance-oriented approach, which has replaced a rule-of-thumb mentality that still dominates much of what we like to think of as sustainable building. The idea that someone can say something is sustainable because they say so, I hope, is no longer compelling. I can predict very close to how much energy a house will use and when it will get uncomfortable by simulating it. Building science, the accessibility to trainings, and the proliferation of high performance materials means that we don’t have to guess if something will work well or if it’s counterproductive.